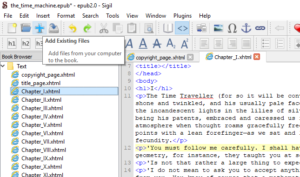 Following the success of our last article on ebook editors, we decided to create an Ebook formatting 101 with the three most popular converters: Sigil, Calibre and Vellum. The series starts with Sigil, that being the one true professionals use and the one our team recommends for instant success – and the one we receive the most questions about. If you always wanted to try it but never dared, stay with me: I’m just as a beginner as you are. 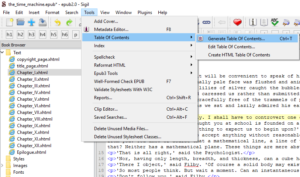 While I consider myself highly computer literate, I was always reluctant to use it: why should I switch to a code based editor to create ebooks when Calibre can do it for me with one click? But then our in-house ebook editing superstar, Csilla convinced me to give it a go. She argued that I won’t only get clean code (about which I as a reader and writer couldn’t care less) but my books will display more consistently across devices and apps. I documented my journey, so you can follow it step by step. You can download the file I made by clicking here and use it as a template. Sigil can obviously do much more than this: I just wanted to help you get started on your journey and give a guide for using it. 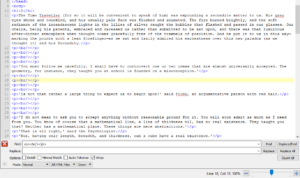 I’ll try to use the html editor as little as possible – it really gives me the heebie-jeebies anyway. Then I opened it: this doesn’t look easy. For presentation purposes, I decided to download a html version of The Time Machine from the Project Gutenberg. I copied and pasted the text into the big white area in the middle. It automatically asked me whether I want to keep formatting, and I said no: I went for the plain text option. This means that all manual formatting, including italics or bold will be lost and has to be replaced manually. If you have written a novel, it is probably in a word document. If you copy straight from the word document and keep the formatting, your code will be full of rubbish – unnecessary pieces of information. 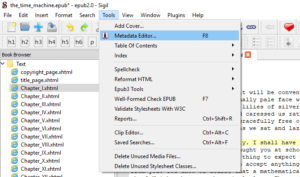 Our pro, Csilla recommends to save from word as a html file and copy that in html mode. (You can change to html view by double clicking the tab.) You have to copy your text between the two <body> tags. I realized that I probably need more of these little white windows: one for each section of the book. 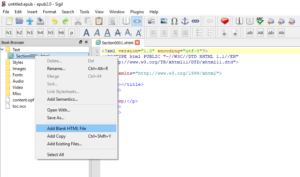 So I created more: right click on the ‘Section0001.xhtml’, and then ‘Add Blank HTML File’. Now that I have enough empty windows, I separated the file into chapters and parts of book. While I was doing this, I also renamed the files meaningfully and added semantics (both in the same menu). With the file names, make sure to use _ instead of a space, e.g. 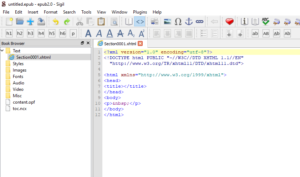 Chapter_1.xhtml. These names will function as links. Semantics in this context only means that I allocated each file with a function as part of the book: every book has to have a cover, a title page, a copyright page, chapters (or a main text). Luckily, a description is included to all semantics items. This was the point where I realized that the evil Sigil randomly added extra lines to my text. Instead of jumping off the fourth floor, I opened the html editor and pressed ctrl+f for searching. With one click, you can replace all <p><br/></p> with nothing. You can use this find and replace method to clean up your code as well and remove any unnecessary lines of code, such as font type or size. As my next move, I marked my chapter titles as H1 in the visual editor: this won’t only make them stand out but is necessary for the TOC generator to work properly. Then I decided my book looks fancy enough already and went to edit the metadata. I believe there is not much left. Generating the table of contents is fairly easy and straightforward. You can even decide what you want to include in it and what not. OK, I think I only have to add a cover image, and it is ready. For this, I have to click the big blue + and select the image from my computer. It will automatically go in the ‘Images’ folder on the left. I right click the file and set is as cover image. I open it in Calibre to give it a last check and upload it to PublishDrive: it is valid! My first Sigil epub passed the tests.